Deputy Animal Control Officer Lanny Brown is shown with Camilla, one of the dogs available for adoption at the Highland County Dog Pound. Highland County Deputy Dog Warden Lanny Brown admits money is tight when funding comes from $12 dog tags, but in addition to lighting and ventilation, other improvements are sorely needed at the Highland County Dog Pound. Some of the cages in need of repair or replacement have visible damage caused by vicious dogs that the animal control officers bring in. Cathy Seifer, the senior dog warden, would like to see facility mirror more closely what she sees in other Humane Society shelters. Another item on their “wish list” is to employ a back room not currently being used for the purpose of quarantining sick dogs or when a litter of puppies is brought in. In addition to the wish list, Brown’s other wish would be that people would be responsible and tag their dogs. Brown said the problem isn’t as bad in Adams and Brown counties because many have hunting dogs. At the beginning of the year, Brown said, he had a list 40 pages long of people in Highland County that were known to have not tagged their dogs. After repeated visits, phone calls and issuing of citations, that list is now around 17 pages. Both Brown and Seifer would also like to see Highland County’s dog tag price be more in line with Fayette, Clinton and Brown counties, which they said charge $14 for dog tags. Another thing people don’t realize is the dog pound is a great place to adopt a new friend. After a stray dog is picked up, the owner has 72 hours to search for the animal or call the dog pound, because after three days the dog becomes the property of the county. The adoption fee is $57, of which $12 is for tags, and the new dog owner receives a voucher that they can take to any Highland County veterinarian clinic for $75 off spay or neutering. Payment can be made with cash, personal check or money order since the dog pound is not equipped to take credit or debit cards. 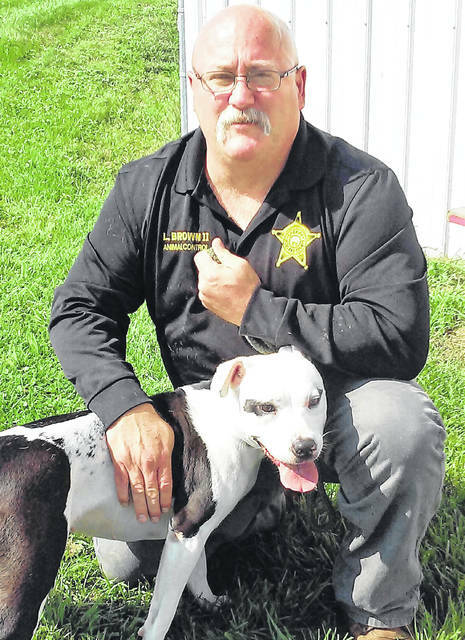 The Highland County Dog Pound is open Monday through Saturday from 8 a.m. to 4 p.m.
https://www.timesgazette.com/wp-content/uploads/sites/33/2018/09/web1_Lanny-Brown-with-Camilla.jpgDeputy Animal Control Officer Lanny Brown is shown with Camilla, one of the dogs available for adoption at the Highland County Dog Pound.